Mike has 25 years retail trade experience which ensures you can buy with confidence in the knowledge that you are buying from a reputable trader. 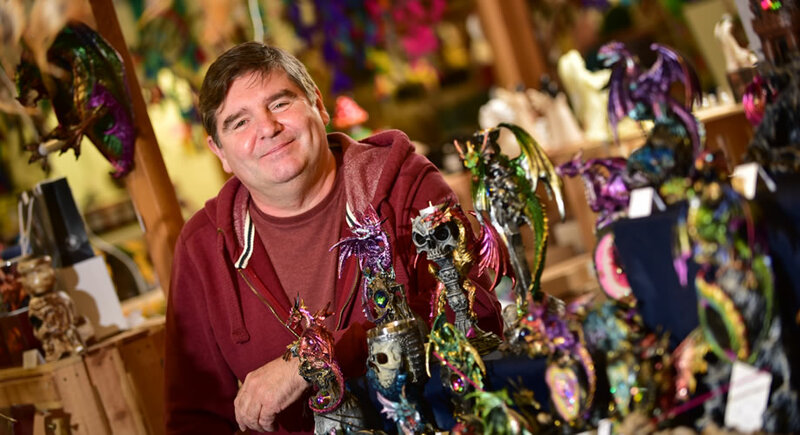 We have a huge range of ornaments on display including fairies, unicorns, cherubs, Buddhas and angels, as well as candles, tea light holders, oil burners, dreamcatchers and much more. We also stock a wide range of fantasy and gothic style gifts and collectables to include Dark legend Dragons, skull ornaments, Lisa Parker mugs, Anne Stokes canvas plagues, Incense sticks, cones and holders. Our new range of driftwood tea light holders are handmade by us and each piece is one of a kind to make a unique gift or table centrepiece. We pride ourselves in providing a friendly and enjoyable shopping experience without any pressure to buy, take your time to browse our extensive range of gifts and collectables; we are hand for any guidance with making a purchase. There is something for everyone, friends or family – buy that something special for the home.